Mix Cornstarch with 1/4 cup of water, make sure it is mixed well so you don't have lumpy gravy. Put 1 can of water in with 1 can of stock and bring to a boil. Then slowly mix in your cornstarch mixture. After is is mixed well mix in your veggies, ham and seasoning. After everything is mixed well pour into a 13 X 9 baking dish. 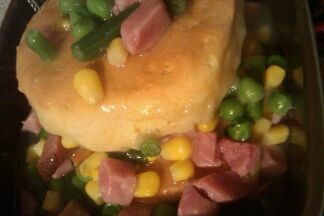 After you have it in the dish take your biscuits and flatten them just a bit and place them on top. Place in oven on 375 degrees for about 20 minutes. The biscuits will be nice and brown in order to be fully cooked. Serve and enjoy :O) Will serve about 4 adults.